We primarily offer adult-focused vacation adventures, but also welcome families wanting to experience cowboying the way it was in the 1880's. You'll come to understand what it takes to be a cowboy on a ranch today, but you will also learn the traditions of the cowboys of the past. The Cross M Ranch is located 12 miles up Little Dry Creek in the Big Sky Country of Eastern Montana. The Cross M is a family owned and operated working cattle ranch, not a 'dude' ranch. We run cow/calf pairs on over 10,000 acres where there is plenty of space to breathe. 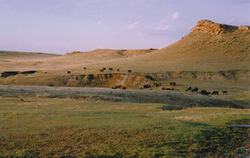 Very little has changed since the Texas trail herds came north to graze and prosper. This is a country that was 'Open Range' and therefore 'wild and wooly'! This is the land where cavalry troopers from Fort Keogh fought the Sioux, where the buffalo hunters plied their trade and where outlaws and rustlers followed the outlaw trail. You will ride back in time as we move cattle along these same trails and you will be able to see evidence of the Old West from wagon and stagecoach trails, old Indian signs, cowboy graves and buffalo wallows. Not only will you be in the same country, but you will see and experience some of the same scenic beauty that was portrayed by the famous photographs and paintings of American icons such as L.A. Huffman, Lady Cameron, Charlie Russell and Frederick Remington. Every week at the Cross M Ranch we'll be doing the things that need to be done on a working cattle ranch. That means moving cattle, doctoring, mending fences, checking on the herd and helping the neighbors with various aspects of everyday ranch life. No matter what week you book with us you are likely to be going on a cattle drive and helping move cattle from one pasture to another. maybe one mile, maybe eight miles. We want to emphasize that no matter what week you come stay with us, you're likely to be going on a cattle drive, rounding up cows and doing the different kind of things that make up a cowboy's life. There is always 'cowboying' that needs to be done on the Cross M.
We also offer Branding specials, Miles City Bucking Horse Sale Celebration and Hunting. We feel honored to share this rare lifestyle with a few special guests each summer. If your idea of a getaway vacation involves sun, dust, sweat, work on horseback, lots of laughs, a cowboy prank or two and riding free across the open range in the 'Big Sky Country', then give us a holler, we'd love to have you. Give us a call and book now as spaces are limited for the vacation that you will never forget! We accept no more than 8 guests at a time, thus ensuring that YOU get to be the cowboys and cowgirls. Adults and young adults only, 12 years old and older. All young adults under 16 must be accompanied on any rides by one parent. Come spend a week or more with us and 'cowboy'! Directions: From I-94 at Miles City take Montana Highway 59 north towards Jordan to mile marker #59, turn west on Little Dry Road. Travel west for 12 miles to the ranch headquarters.